I’m in the midst of a nasty flu and I’m sweating, and extremely dehydrated. I ruptured a disk in my back three weeks ago. I miss my wife, she’s a thousand miles away. I’m in a psuedo-wilderness, camped in an alcove in the Escalante Arm of Lake Powell. My Jewish companions are on lockdown, it’s the Sabbath. I feel the need to rest, but the opportunity to explore. 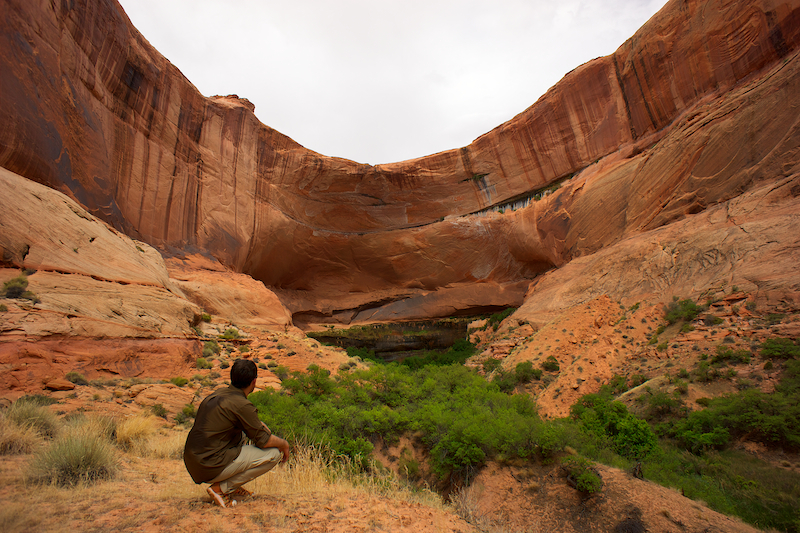 I get in the powerboat and deliriously navigate to the end of the canyon, the whirr of the gas engine lulling me to doze while Abbey screams in my head about the disaster that has risen up the walls of Glen Canyon. I ignore the guilt, and floor the throttle. After idling through a maze of flooded tamarisk, I beach the boat on a tiny sandbar and flop out, wavering like a drunk, struck by a combination of physical debilitation and desert heat. I look for my water bottle. I forgot it back at camp! How stupid. Certainly there’s a creek, or a spring, or something up here. I check satellite phone reception. Nothing. So I leave it in the boat. Dead weight. There’s only one direction to go. The end of the canyon. That’s when I hear the trickle of the stream. I wade down a steep slope of loose sand past the rarely blooming prickly pear and unmistakably aromatic juniper, tumble through broken talus, and ignore the game trails though the willows when I see the shimmer of the water surface. I remove all of my clothes, enter the deepest pool I can find (18 inches), lay on my back, plug my nose, and drink. I think I fell asleep in the water after making my way to a shallow sandbar. I woke up to the tickling of minnows against the sides of my stomach. I had a clear head, but a mouth that tasted of algae and grit. My groin was exposed to dry air, and hot sun, an oversight for which I’d pay dearly for the next day. I emerged from the cool water and searched for my clothes. Fifteen minutes passed before I found my second shoe. I let out a belch that echoed off the canyon wall, reminding me that I was hydrated enough to continue. I nibble on a piece of sun-dried smallmouth bass from my snack stash, a tenkara catch from two days before. I walked up the creek towards the seep-stained walls of the amphitheater, and discover a bit of healing in having reached my destination. Five hours later I return to camp.